Entering senior management marks one of the most profound transitions in an academic career. The high held posts have the command and all the perks but it also comes with a host of practical and ideological challenges. Integral organized a communicative training program for the academic leaders at the University campus during 14th - 18th August. 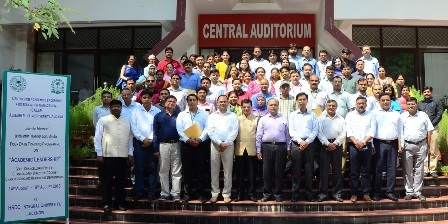 Many Vice-Chancellors, Directors, Pro-Vice Chancellor, Deans, Chairpersons and Heads of Departments from different universities and institutes around India were invited to attend, share their experiences, while they themselves assimilate and integrate the industry’s best techniques in academics. More than a dozen esteemed Universities and educational Institutes namely Amity University Lucknow, Babu Banarasi Das University, Jaipuria Institute of management, and many more actively took part in the various sessions of the 4-day program to equip themselves with the industry best techniques to offer premier quality education to their scholars. In the inaugural day address Professor Aqeel Ahmad Vice Chancellor acting, Integral, remarked that “Teachers must listen and learn for constant growth in their career and to break the monotony in their schedules”. Dr. Syed Aqeel, Director HRDC, Integral University thanked the participants for their desire to further polish their skills and wished them success for their vital role as academic leaders. It is a Human Resource Development Center, Integral University under the aegis of UGC-HRDC Aligarh Muslim University and Centre for Academic Leadership and Education Management (CALEM), Ministry of Human Resource Development, Government of India initiative. There were 16 sessions on various topics related to quality education like effective leadership, use of ICT, Handling student diversity, Student support and placement services etc at this Academic Leadership program. 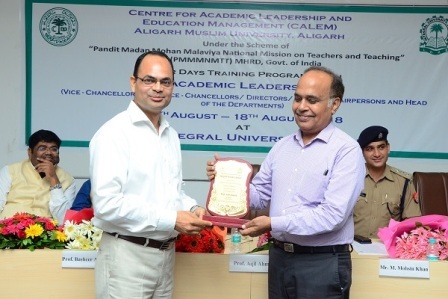 Professor Anoop Kumar Saxena, Dean Management Studies, Integral University interpreted the Effective Leadership and Strategic planning in the education sector in the inaugural day session of the program. He also elaborated on building terms and the subject of strengthening alliances and managing external stakeholders. A session on “Budgetary process and strategies for effective resource mobilization”, a topic of great importance for the educational institutes was conducted by Prof Basheer.A. Khan, former Vice Chancellor, University of Pondicherry. He also explained and covered topics like Quality assurance, Accreditation and enhancement of Institutional performance. 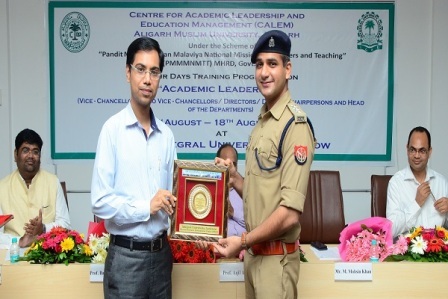 Mohd Mohsin Khan, Deputy Superintendent of police, Agra highlighted on the techniques and the art of effective and timely decision making and diffusion of authority. 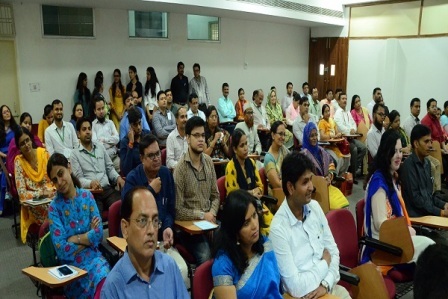 The Issues, governance and leadership in Higher Education in India was reviewed by Prof Nazim Ali, Faculty of International Studies, Aligarh Muslim University while Dr. Zeba Aqeel, held an interactive session on handling student diversity and coping with stress at the university level. Taking on a central University leadership role involves a lot of preparation and self-analysis, having the capacity to influence the direction of a great institution, to see staff inspired by plans for change and to watch as a good idea radiated out across an academic community, to be put into profound effect. Such Academic Leadership programs thereby are the assets to any individual or an organization. The Union Ministry of Human Resource Development, Govt. 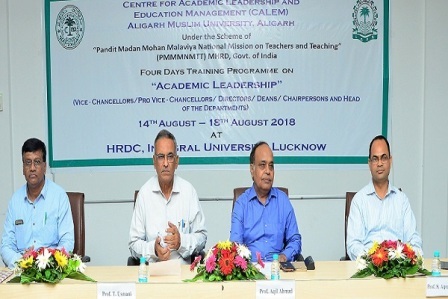 of India has sanctioned the establishment of the Centre for Academic Leadership and Educational Management (CALEM) at the UGC Human Resource Development Centre, Aligarh Muslim University, Aligarh. The CALEM is working to revitalize colleges, institutes, and universities by organizing courses for their faculty. 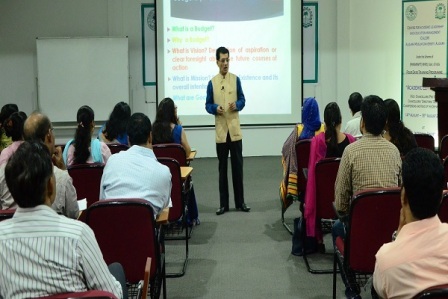 Integral University, Lucknow is one of the Regional Centers for conducting various courses of CALEM. The HRDC, Integral is now all set to host yet another fruitful edition of CALEM from 7th September onwards.